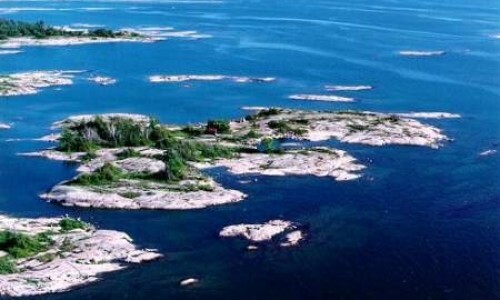 Friend Island is a small island located at the south end of Pointe au Baril. This island is primarily open, flat bedrock with small pockets shrubs, trees and herbaceous vegetation. Long, sloping fingers along the shoreline create ideal, sheltered conditions for coastal meadow marsh communities, supporting a high diversity of flora and fauna, including a variety of amphibians, butterflies and dragonflies. The property is located close to a Conservation Reserve, contributing to the protection of other natural values found in the area. This property represents one of the first sizeable donations to the Trust and included a bi-national dedication ceremony to recognize the American donor. Friend Island has long been a favourite destination for Pointe au Baril residents and visitors to the area. Its location makes it ideal for afternoon picnics or ‘shoal hopping’ on the open bay. Being a high use location, it has seen its fair share of issues over the years, namely garbage, and dozens of fire pits. Because of action by the GBLT and its volunteers, this has changed. As a result the island has reverted back to a pristine condition. I chose to become the steward for Friend Island because I’ve spent nearly every summer of my life along the shores of Georgian Bay, and I want to make sure it stays protected for years to come. The GBLT and all its volunteers make sure this will happen.